The youngest boy has crossed the last threshold out of babydom. 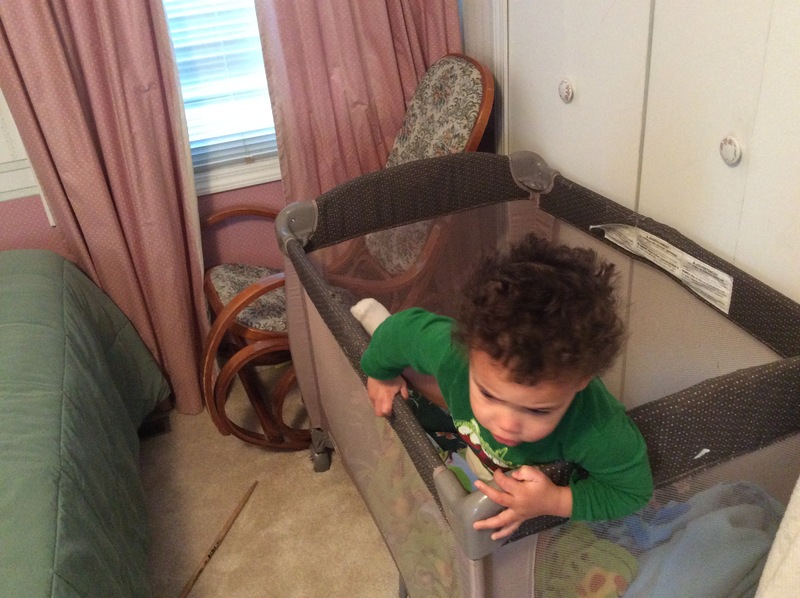 He’s learned to escape his crib – only his motive is not so much escape and it’s not really a crib he’s exiting. They all, in their own time, figured out how to shake free of the crib. Big Brother executed his escape plans quietly, never letting us know he was plotting a breakout until we heard the loud thud from his bedroom floor. 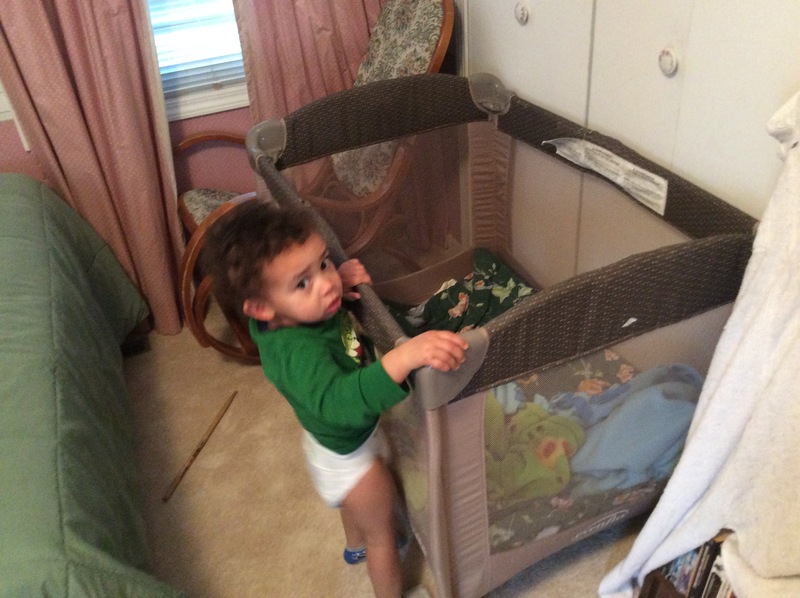 Being first-time parents, we had foolishly parked a dresser at the foot of his crib. Climbing up to the top of that dresser was Phase One of his plan. He hadn’t really thought through Phase Two, which resulted in the thud of his bouncing off the floor. We couldn’t believe he wasn’t broken; his thud sounded like a cannon ball hitting the house. We immediately banished the dresser and made all manner of rookie parent safety adjustments to his crib. Buster was a loud prisoner. He wouldn’t stand the injustice of being left in a crib and he let us know it. It was only a matter of time before he made his first thud in a misjudged leap to freedom. His thud wasn’t as loud. There was no tall dresser to climb onto, and he was a smaller kid, except for his lungs. Still, we lived up to the letter of the parental contract by checking on him to make sure he was a bouncer. Then we put him directly back to bed. If he kept making thuds like this, after a while, I’d see about lowering the crib mattress to make egress more difficult. He kept making thuds, and eventually I adjusted his crib. After more thuds, I adjusted it again, and again. When his hole was as deep as it could go and he still climbed out of it, we put him in a big boy bed. That wouldn’t hold him either, but at least it would give some relief to the floor. Big Man doesn’t sleep in a crib, not because he’s bigger than his brothers were and might put a hole through the floor. 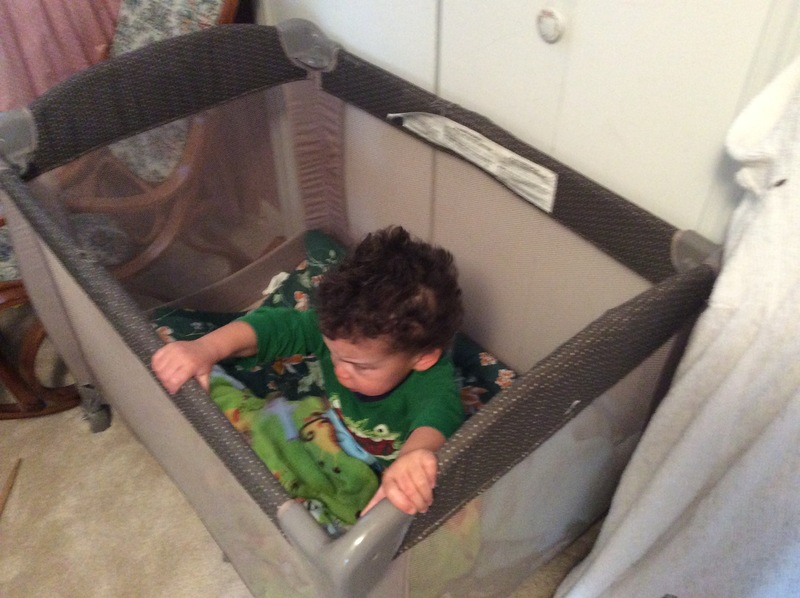 He took a liking to sleeping in his pack-n-play after he graduated the cradle. 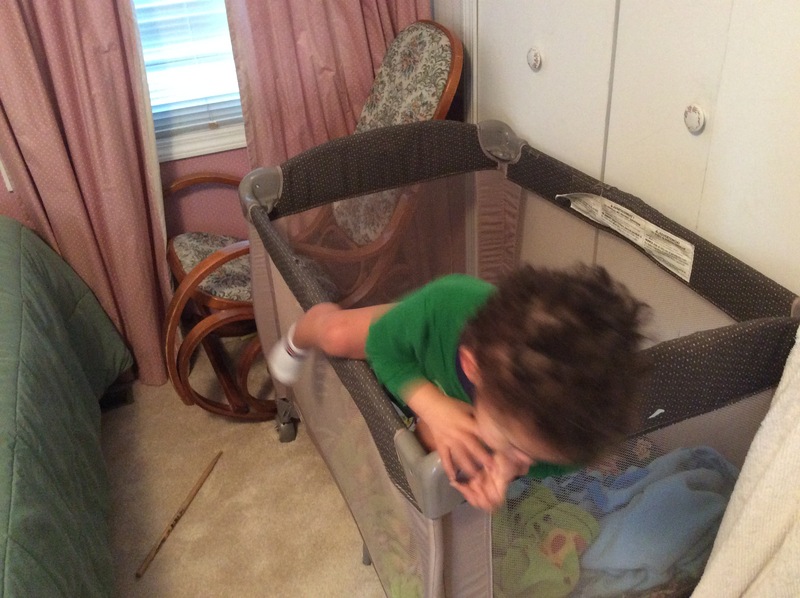 We tried the crib a few times, but he preferred the pack-n-play. He sleeps well there and hardly ever acts like a caged animal. And now he can climb out of it. There are no thuds. 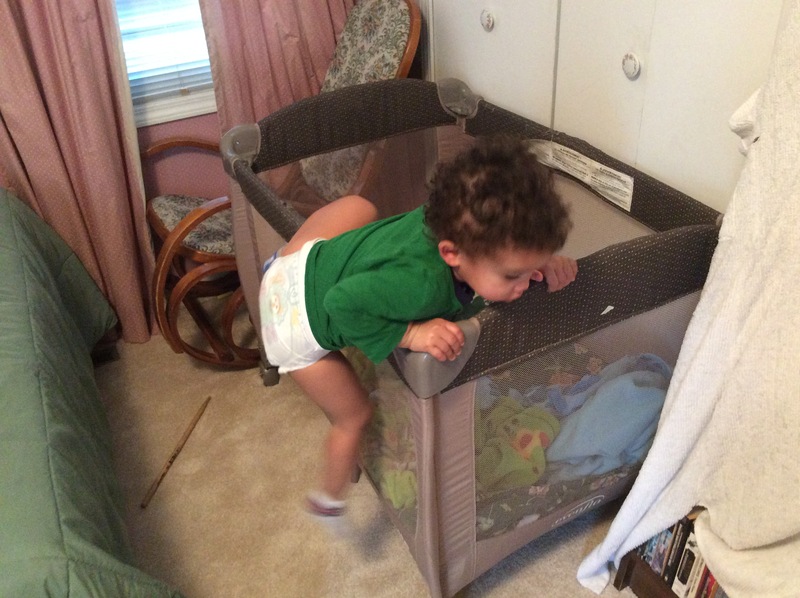 It’s lower than the crib, but the deftness with which he climbs out makes us doubt he’d thud out of the crib either. The kid is a ninja, using his feet and hands in concert to roll silently over the wall. I’m hoping our graceful little country squire will soon begin offering to make breakfast. 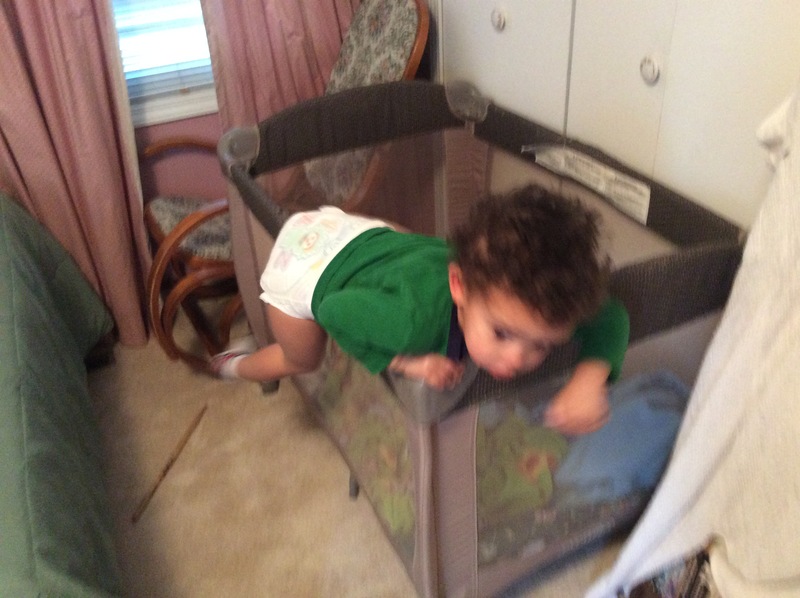 This entry was posted in Toddler Trouble and tagged babies, beds, boys, brothers, cribs, family, fatherhood, freedom, humor, toddlers. I’m hoping he won’t be in jail that much in the future. What can I say? Proof is right there in a series of colour photo’s. He broke that cookie jar and framed Jimmy. Sorry Buster.